Title : Who Stole the American Dream? This book left me both angry, and charged in the way a good book makes you say 'yes, that is how this all fits together.' It's a canvas that connects many dots through a deep excavation of the socio-political events of the past 30 years - and the picture is not pretty (the man has been reporting for awhile) It made me rethink why the past past five years of financial cataclysm occurred. It is also - almost - above the politics of the left or right, though it's not hard to see Smith coming in from the left. But don't let that distract you from the fine research, the data, and the excellent writing that helps explain where we have landed today in the US, with rare authority. If you look around at yet another ostentatious display of wealth and it prompts you to think "we'll look back on this time without a shred of doubt as a Gilded Age," and you're not delighted by that, this book has many arrows in the quiver that show how we are indeed there - a plutocracy going through the the motions of a republic. Think of the Lewis' "The Big Short", Murray's "Coming Apart", and "Too Big to Fail," and a few other books that have interpreted parts or the whole of the past generation of what has happened in politics, business, and the relationship of policy and business, and how the now casual and often fraudulent and reckless collusion of the two explains much of what happened in the wreck and wake of the past five.From its explication on the rise of the 401k and its predatory structure, to the bankruptcy laws engineered to reward failed management, to the more obscure and fascinating origins (the fall of state usury laws, deregulation of securities laws, the US Congress of 1978 and the Washington lawyer who helped set the past generation's practices in motion, to the deconstruction of outsourcing as a corporate business model, and to the now familiar fireball that was the great crash and housing fraud of 2008 -- Smith lays out a case that we are indeed a nation of the few, for the few, and does so, again, with great authority. The question he asks is: Can we be a democracy that makes it a policy to be for the middle class? This ideal seems quaint in a US enamored by hyper-wealth and instant success, and the book's success in part is that it makes me re-examine my own views on success, and the accountability we have - or should have - to civic institutions that ensure a system that enables a middle class to be the dominant political force in the American experiment. Clearly today it is not, and most of us tacitly aid and abet that failure, without examination.Finally, the book is a technical success. A seasoned reporter who 1) stitches a wide array of events together, with good data, and 2) who creates a narrative that draws you in. And while it is a summary conclusion, Smith takes to heart that he should point to solutions, many of which, directionally at least, make sense.If there is any flaw, it is the leftish strain where Smith steps outside the narrative and exonerates President Obama on the certain specifics of his own failed policies, while the case he makes against the political and business caste we have in place now would seem to indict our current President as being party to these failures (or at least hand-cuffed).Read it, feel uncomfortable, and maybe, take something away that makes you do something to start to steer the ship back on course. I know I did. 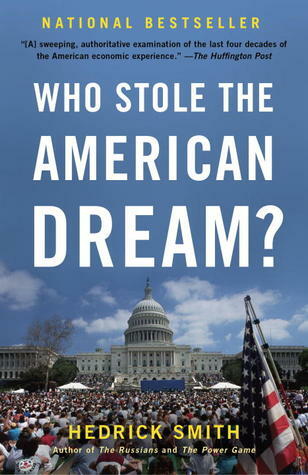 I just finished "Who Stole the American Dream? ", and it has instilled in me a deep depression from which it will take months, possibly years, to recover. Nonetheless, I give it five stars for explaining, in minute detail and from many angles, how Americans have been robbed of their political power by those who reside in the upper reaches of Richistan. It's nauseating. Step by step, Smith methodically spells out how we lost the dream on account of our nasty, crooked little friends at the U.S. Chamber of Commerce and their ilk: the organization and activism of corporate lobbyists, the voiding of the social contract between corporate elites and workers, the robbery of our pensions and the siphoning of our 401ks, the decimation of consumer protections, the criminal destruction of our home financing systems and the subsequent theft of our homes, destruction of local economies by the heirs of Sam Walton, the political acceptance of usury, the gutting of unions, offshoring of jobs, and on-shoring of jobs. Meanwhile the folks in Upper Richistan buy a couple more yachts and sneer at the little people. All of this points to the disenagagement of "American" corporations who were once loyal to America. They aren't American anymore, but they're still calling every shot here. We all know this, don't we? We know we're moving into a new era in which the word "nation" does not mean anything, don't we? Some of us were fortunate enough to experience an America where our voice counted. When I was a very young girl, I remember my father taking our family to Washington D.C., where we were ushered into Charles Percy's office to meet with the Senator himself. I was too young to remember or understand what my parents talked to the senator about, but the visit made a huge impression on me. We were citizens meeting with our elected representative, sharing our concerns and views. We are no longer living in that America, but it existed once. I digress.Smith seems to think we can get a representative government back. He outlines a plan at the end of his book as to how this can be accomplished, using good old fashioned citizen participation in Washington politics. "Look at the Arab Spring!" he suggests, "If they can do it, so can we!" Maybe, but the Arab Spring did not come about through using "business as usual" governmental channels. It came about through more subversive tactics, extra-governmentally. I don't think he has really looked that deeply into Arab Spring. David Graeber, author of "The Democracy Project" and "Debt: The First 5000 Years" has looked at Arab Spring, and looks at the Occupy Movement as its American cousin.At first blush, people might think that Smith's more conventional approach to recouping the American government is the more practical and likely to bring results. But, given the intransigence of multinational corporations in Washington, it is quite likely that Graeber's anarchists may be more on the right track. As we move forward into the era of Corporate Global Feudalism, only time will tell if we acquiesce to our new serfdom or, whether by Smith's methods or Graeber's, we decide to fight. What an eye opening book. The author does a great job summarizing his points based upon the events of the past 50 years and their impact on the Middle Class in particular. The main point is that when business and working class/labor force goals are aligned a virtuous circle is created whereby the needs of both are met, profits are made, and the economy as a whole prospers. The author's point is that in the past 30 years in particular business has shifted away from supporting their work force to bolstering the wallets of share holders and wallstreet. The shift to profit at any cost, the movement to driving down labor costs, and seeking out resources in other countries has driven a huge schism between management and labor and unless some serious shifts in business and economics are made the downward spiral will continue.One salient example to all this is covered in the chapters on Walmart. Walmart's drive to offer consumers the lowest cost possible has pushed manufacturers to move their factories over seas to China. By pushed that means Walmart has specifically told manufacturers they need to move their factories over seas to reduce cost or their products will not be sold at Walmart. To a business, this is the death kneel and those who have tried to fight this have sufferred tremendously. While consumers get the lowest cost, that cost is then passed on to the rest of the economy causing loss of jobs, increased dependency on welfare programs, and increased dependency on foreign goods and services. Walmarts profits soar but everyone else suffers in the long run. Since reading these chapters I have not shopped at Walmart, instead focusing more on local businesses.I think the author does a fantastic job presenting his information culled from years of research and reporting on these topics. There is clearly a bias here towards labor and the middle class, and I would like to read some counter points to his arguements to make a more informed decision on these topics. Still, what I have learned is very jarring. If it were up to me, this would be required reading in elementary school!!! This book's message should be on every t.v. newscast on every station every day. Clearly written, this book offers a good overview of many of the problems facing the poor and middle class, and proposes solutions. Superb book,the best i have read so far on the problems that have beset the U.S. and why they happened. Should be required reading for high school seniors and university students as they will have to try and change the system. The author also provides practical solutions and i am sure a lot of Americans would embrace his ideas. There seems to be no shortage of books looking at the downturn of our Country's fortunes, and what is needed to correct our problems. Look, for example, at Bill Clinton's "Back To Work, Why we Need Smart Government for a Strong Economy"; Jeffery Sachs' "The Price of Civilization: Reawakening American Virtue and Prosperity"; Arthur Laffer's "Return to Prosperity"; Edward Kennedy's "America Back on Track"; Paul Krugman's "End this Depression Now"; Tom Friedman's "That Used to Be Us"; Tyler Cowan's "The Great Stagnation"; Thomas Mann's "It's Even Worse Than it Looks"; Charles Ferguson's "Predator Nation: Corporate Criminals, Political Corruption, and the Hijacking of America", etc. Hedrick Smith's book, "Who Stole the American Dream?" fits in with those others, but is among the most readable of them all. Smith presents significant laws, rulings, and events which impacted American society over the past several decades, and drives the impact home by describing real life stories of individuals impacted by those changes. The book is clear and concise, much more so than I would have thought given that it deals with what could be a fairly dry subject.Those in the economic top 1 % of the Country probably won't be reading this book, because they're living the American Dream, and the book's title wouldn't make much sense to them. But if you're among the remaining 99%, this book will hold a lot of interest, because you may be feeling that the American dream of opportunity for all who are willing to work for it doesn't seem to be working out as well as it did in the post WW II boom. Smith lists the problems and changes which have taken place over the time of our current generation, and provides an outline of what changes can be made, and how. Rather infuriating look at the ways the middle class has been fucked over, in the last couple decades by rich people, and then those same rich people wail loudly when the middle class says something about it, despite leading us into a recession, and being bailed out by the taxpayers. Talks about ARM mortgages, 401ks, retirement, health care, minimum wages, non-existent cost of living pay increases, executive bonuses in the 10s of millions despite a failing business, capital gains taxes, costs of going to college, a dismantling social safety net, rigged stock market forces, and a plethora of other little tricks that make sure that you don't rise above your level in life, and never stop paying interest or fees to large banks. If there ever was a book that could start a fiscal revolution, this one is it. Great read until the end when, it seems to me, the author blames all of America's ills (ok, perhaps that's a stretch) on the Republican Party. No reference AT ALL to America's growing entitlement state or complete lack of education/good grammar. Total crock of poo. Overall, good information/historical perspective until the conclusion of the book. Sometimes it just takes someone to connect all the dots. Many of the things Mr. Smith talks about I remember, but when you put them in a linear position and see them you will understand why we are where we are.Great read. When a book starts with a quote from Louis Brandeis to Woodrow Wilson regarding whether the concentration of wealth and democracy are compatible, you should know you are starting out on the journey as laid out for progressive thinkers. This work did not, for the most part, disappoint in that regard. That said, there are elements of this narrative that ought to give pause for thought to just about any segment of the political spectrum.The numbers often appear to speak for themselves, but I do note that when those number sets that are the 'most shocking' one finds that opposing viewpoints get essentially no discussion. And I do wonder whether the author may have bit off a huge hunk by going after all the players (banks, congress, the real estate market, the federal bureaucracy), rather than focusing on one or two areas and developing it/them more fully. I have to agree with most of the posts here that Smith provides a detailed description of how the middle class has become nearly irrelevant. He provides in easy to read text the details of the step by step process that the wealthy took to take back the wealth of America from the middle and working people of America beginning in the late 1960s. It corresponds very neatly with the dissection of that process by Nancy MacLean in "Democracy in Chains" and shows the impact of many of the efforts to stop the middle class from swaying policy making. A must read for anyone who loves America and is thankful for the support it gave us to become good citizens. Got the ebook from the library but had to buy my own copy. While I agree wholeheartedly that the problems defined in this book are big problems I am in nearly complete disagreement with the suggested solutions. Government as it was and is caused the problems and there is no rewind button. Relying on the same system that caused these problems seems futile and depressing to me. A truly insightful look at the history of wealth creation at the expense of the American middle class. Harrowing in its scope and implications, and inspiring of the work we must do to improve things. I should get a prize for finishing this book. I have never read a book that had basically new troubling information on nearly each page. Lewis Powell wrote a powerful private memorandum in 1971 that included the statement: "Business must learn the lesson .. that political power is necessary...and that when necessary, it must be used aggressively and with determination." "Nor should there be reluctance to penalize politically those who oppose it. "One of the first tests was brought out in the section "Rolling Carter on Taxes" on page 20. "Finally, business felt powerful enough to challenge President Carter on taxes. In his 1976 campaign, Carter had derided the US tax code as 'a disgrace to the human race' (sound familiar?) because it had so many loopholes for the wealthy and for corporations, enabling them to reduce or escape taxes. So Carter sent Congress a tax bill that would close many of these loopholes and end tax breaks for the affluent while cutting taxes for lower-income families. Congress, by now under sway of the strong business lobby, balked at Carter's bill and then started rewriting it to tilt it--not against, but in favor of business and the wealthy. Instead of tax increases, the bill came out with $18.7 billion in tax cuts, including a deep cut in the maximum capital gains tax rate for investor.." The stark reality of the effect of raising the boats of the top 1% had no effect on the fate of the middle class. On page 73: "From 1948 to 1973, the productivity of all nonfarm US workers grew by 96.8% and the hourly compensation of the average worker rose 93.7%. From 1973 to 2011 the productivity of the US workforce rose 80.1%, but the wages of the average worker rose only 4.2%, and hourly compensation--wages plus benefits--rose only 10%. So while productivity was rising close to 3% a year, hourly wages of the average worker, adjusted for inflation, were essentially flat, the same in 2011 as in 1978. Three decades of getting nowhere. "The technology gap is given as a reason by business for this effect, but in fact in Germany the workers have had a totally different experience outlined in page 386-7: "Since the mid-1990s, the German economy has grown faster than the US economy, and its middle class has shared more of the gains. Since 1985, Germany's average wage went up nearly 30% versus only 6% in the United States. In foreign trade, Germany generated $2 trillion in trade surpluses from 2000 to 2010, while the United States racked up $6 trillion in trade deficits. So today Germany still has twice as many people working in manufacturing as the United States--21 percent of its workforce to 9 percent of ours. "This book also blows a hole in the argument that I heard the CEO of the Chamber of Commerce use yesterday that there aren't enough high tech graduates from the US. In fact big companies such as IBM have set up whole sections of foreign workers to replace the high tech US workers (after they trained their replacements). What I came away from reading this book is that we shouldn't be disdainful of the pre-WWII germans for sucking up Nazi propaganda. We have been led down the path by the propaganda of the elite and their congressional stooges. Sen John McCain is quoted on page 417 "All of us (politicians) have been corrupted by the process where big money and big influence--and you can include me in that list--where big money has bought access, which has bought influence." Who Stole the American Dream? Can We Get It Back? For people, like me, who are not savvy with politics or economics this was a delightful surprise. Hedrick Smith did an excellent job of discussing the topic in an easy to understand manner that educated and provoked thought. I highly recommend this book to anyone looking to understand better the current state of affairs in the US. I found this extremely interesting and very well written. I've read other books by this author (The Russians, The New Russians, The Power Game), which was why I decided to read it even though I'm more of a fiction reader. Also I've been really wondering exactly what went wrong. I'm having to reexamine some of my previously held opinions, which have been close to those held by the Tea Party conservatives: government is too big, too much government spending, trickle-down economics. Since we're part owners of a family business we naturally are wary of inheritance taxes that can put our kind of business under. Our business is heavy construction (we demolish not build) and a bad bid can result in no work or a job that loses big money. Nevertheless, I can see that taxes are going to have to be raised for wealthy people. Of course, being only human, I want them raised for those richer than us!This is not a book to read if your blood pressure is already high. I was angry the whole time I read this book as I read of the toxic mortgages people were tricked into and the way people's jobs have been stolen and shipped to China or stolen and given to foreigners brought here because they wouldn't have to be paid as much or given benefits that the people they replaced had. I can no longer shop at Walmart.I think there is an underlying factor not brought up by Mr. Smith. The kind of greed and selfishness demonstrated by the CEOs of companies and banks mentioned in this book are a natural result of the "me first" attitude prevalent in this country today. When ethics is no longer a subject in law or business schools, when cheating is prevalent and not considered wrong by students in high schools and colleges, when morality is scarcely thought of and when misbehavior results in a six figure book contract for its perpetrator we shouldn't be too surprised at the kind of behavior that Mr. Smith writes about. I'm not excusing it, believe me. I'm just explaining it. Unless there is a change in attitude we can expect more of the same or some other equally reprehensible behavior. The author examines what has gone awry with our economic and political system. Think, too much money involved in our political process, gerrymandering, political party polarization, and a breakdown of both corporate and political devotion to country and the premise that we are all in this together. In light of the current state of our country, I found the book to be profoundly depressing, even though the author says that the only cure is citizen involvement. Hedrick Smith brilliantly documents the slow moving, yet inexorable decline of the American middle class, and the American dream. In a highly readable fashion, Smith documents the individual events beginning with a Lewis Powell memo to corporate heads in 1971 through myriad legislation passed through the halls of congress, at the behest of the moneyed interests and lobbying industry which has run rampant these past 30 years. These laws, have had devastating consequences on the equality of opportunity in what was once the "land of opportunity". Some of these bills were intended to do just that, while others were designed to strengthen our middle class, but through creative loopholes or sloppy legislating, many had unintended consequences. The accidental expansion of the 401K program, created as a corporate perk for one CEO's in one congressman's district, instead has led to the virtual elimination of guaranteed retirement in the US. The first 2/3 of the book are incredibly discouraging, as the power of wealthy individuals, and corporate interests becomes clear, and both political parties to some degree are beholden to these interests. The solutions Smith offers, rely on an awakening of the middle class in unison, to fight back and regain their influence. In addition, it is clear that the steeply partisan divide will have to be overcome. Not sure how much chance of this happening anytime soon, as so many are apathetic, and feel they have no power to change things. Sadly, perhaps things need to get much worse before the majority will rise up. A start, would be for more people to read this book, and realize what has happened over the last three decades was not an accident, but rather a concerted effort to wrestle control of the government from the people. Hedrick Smith's book is so compelling because he documents the multiple forces at work that have utterly destabilized the foundations on which the great American middle class was built. We've been asked to take more and more responsibility for our own health and financial security at the same time that wages have fallen. The cost of housing and higher education have skyrocketed at the same time banksters deregulated Wall Street and flooded us with offers of hundreds of thousands of dollars per household in credit offers. Is it any wonder so many have lost their homes, their jobs, their retirement savings? Smith's anger at what's happened and the people responsible for it is palpable. The chapters on the foreclosure crisis, the retirement savings crisis, credit, and Wall Street bank collapses are encyclopedic in research and economic in their prose. Most importantly, though, is the opening chapter I. Which Smith documents the concrete steps corporations and bankers took in the late 60s and 70s to retake power in the wake of muscular people's movements for change. The book's one significant shortcoming is the absence of a similarly robust portrait of serious initiatives to make a new set of decisions about our economic lives together. Occupy Wall Street gets a few sentences in a final chapter meant to give us hope and direction for the future. But it seems as if this last episode in Smiths drama must have come at the request of his editors. He doesn't have the heart to write in a nuanced way about where we can look for hope as we build the power necessary to take our country back. I've read several books over the last year on the declining middle class, financial meltdown and widening prosperity gap. This was my favorite of the bunch. While the author has a generally liberal bias, it's the most balanced as well as detailed cause and effect trail of how the US got to where it is today. I also got a lot from the stories of individuals and the step-by-step of how their lives have changed over the last 15-20 years. There's convincing data to support most points of view so I find sustained conviction around primary causes and remedies hard to come by. I've even read a few of the Cato Institute reports which make convincing arguments that most lower and middle class families are actually better off today than 30 years ago. The individual stories were helpful in understanding the human costs at the end of all the economic and policy thinking. The one consideration I have yet see any of the authors take into account is that as hard as the last 30 years have been for middle/lower-class Americans, it's been a huge quality of life improvement for others around the world. So while I get that a job lost in Pennsylvania causes hardship I'm less clear that the hardship in Pennsylvania matters more than hardship in other parts of the world. In other words, the distinction between domestic and global trends for the middle/lower class seem increasingly arbitrary. In the end, I care more about the well being of people in the US than anywhere else but seems like a miss for this book and others I've read to fail to net it out for the whole globe.All that said, this is an awesome book. If you feel disenchanted and disenfranchised from the political process, and upset at the current state of "Government By The 1%, For The 1%", I can't urge you more strongly to READ THIS BOOK.Hedrick Smith, in a very readable manner, works through the recent history of how things have led to today's current political situation, referencing concrete data and studies.This is the book I've been searching for, for years. I've felt disenchanted with the current political system, feeling that Congress no longer cares about the wants and needs of the 99% of the population that aren't rich benefactors, industry leaders, or lobbyists. From Smith's book:"In 2005, Martin Gilens, [a] Princeton political scientist, made a detailed comparison of the policies that voters preferred with the policies that Washington adopted and concluded that politicians had disregarded the view of middle-class voters. 'Influence over actual policy outcomes,' wrote Gilens, 'appears to be reserved almost exclusively for those at the top of the income distribution. 'The book helped clarify what has led to today's overarching, big-picture problems with government (regardless of political affiliation), and outlines steps to get back on the path to what the 99% envision America could one day be.I'd love to see nonpartisan community book groups created around Who Stole the American Dream?, with the goal of using it as a jumping-off point for promoting and engaging in grassroots political action. Who Stole the American Dream? by Hedrick Smith clearly outlines the political power shift that has occurred over the past 4 decades, the result of which has left a decimated middle-class and a wealthier than ever elite. Smith argues that we are not so much a class system anymore, but rather, a caste system, where America ranks among the lowest in developed nations for upward social mobility. I've seen this argument before - that great inequality leads to the rich getting richer, the poor getting poorer, and the economy halting to a sluggish crawl - but in Hedrick's book, he shares story after story of how this has personally affected average Americans. It's sobering. It makes your blood boil. "We are at a defining moment for America. We cannot allow the slow, poisonous polarization and disintegration of our great democracy to continue. We must come together and take action to rejuvenate our nation and to restore fairness and hope in our way of life." I admit to feeling pessimistic about this. All too often, I see too many friends hoodwinked and sold on false ideas. They have been led to believe all too often that the solution is the problem. I encourage them to read this book and see if maybe what they've been told all these years is actually against their best interests. It is hard to argue against facts, and Hedrick does a compelling job of laying out the case of government, business, and average Americans. Highly recommended. Well researched, clear, and factual. This book covers the unraveling of everything that was put into place by FDR. It also devotes a whole chapter to sub-prime loans and the housing market fiasco. It devotes another chapter to the partisan headache we call Congress. Everything in between is valuable information to explain to the next generation why they can't afford an education or why grandma has to live with us.I found it interesting that the 401K option was introduced and marketed as a way to put the control of one's future in the hands of the employee. Having never been offered a pension plan in the years I have been working, I did not know that this was a set back in the middle class pursuit of the American Dream. I was told it was the wisest thing to do to prepare for retirement.The book is dense as is so not everything is covered. But for the most part it is a bipartisan approach to the economy speaking to the middle class and the educated poor. I'm sure there are critics who will pine about what Smith does not mention in his book, and suggest it has a left lean in its prose, when truthfully it discusses what is hurting us all who make less than $200,000. It is a history book of what went wrong for the rest of us and it is a good one.Please read it! There are a lot of reasons to like this book. It's full of really good information about how the US got into it's current unhappy situation where wealth pools at the top and so many people work and work yet never get anywhere. He puts most of the blame on corporations and their shift toward greater political involvement beginning in 1971. The part that resonates most with me is the change in mindset. CEOs used to practice "stakeholder capitalism" where they balanced the interests of management, employees and investors. But now they practice "predatory capitalism" where you shed jobs even when your company is making a profit, because more money is always better. He also talks about when CEOs would have been ashamed to have to have mass layoffs or take their company through bankruptcy, but now these are just tools in the toolbox.I took one start off for the book being way too long. Besides a political/news junkie like myself who would really read 426 pages of this stuff? I had to take another star off for the disappointing solutions chapters in the back. I liked the chapter of recommended policy changes. But his recommendations for changing the political scene, largely surrounding the idea of getting rid of political parties, just don't seem practical at all. You know the very first episode of the tv show The Newsroom, where "sorority girl" asks Will McAvoy and co. why America is the greatest country in the world, and McAvoy goes off? Yeah, this book is like a long-winded answer. Very informative, rather depressing, but also inspiring. The middle class must rise up and find political leaders who are interested in the middle class's well being. Things are pretty hopeless without that. Side note: This book has rather liberal undertones. Maybe I've just read so much about how obviously bifurcated our country is, but I didn't feel like there was a lot new here. It took almost half the book before I felt like he was really getting into new territory. Everything about the 401k section was pretty fantastic, and Part 4 on the whole was rather good, though it fell a bit too often into the anecdotal elements. But Part 5 was again fairly obvious, and while I appreciate that Part 6 tried to lay out some solutions, for the most part they are fairly broad-brushed platitudes.High points: detailing the pension/401k swap, being ahead of the curve on Apple's taxes, and level of detail on some of the predatory loan work.Low points: basically anything about Congress or the Executive Branch...it just didn't feel new or particularly well thought out.Overall: If you were to only read one book in this vein, this wouldn't be the one I recommended. However, there are still some worthwhile, appreciated points, and honestly anything that continues to drill home the point about how screwed up the current economic and political situation is is a good thing, particularly when it comes with solutions, even if they could be significantly bolstered with further detail. I could only bear to read about half of this book; it was so inaccurate. There's something seriously wrong with anyone that touts big government & high taxes. He thinks taxes shouldn't be lowered because that only benefits the rich. Seriously? Make government smaller, lower taxes, and it benefits everyone! He thinks only the super wealthy influence government, but never mentions the leftist unions and their strong influence on government. He thinks IRA's are terrible because companies should still be offering pensions. He fails to mention in that chapter all the companies whose pension funds went belly up in the downturn of the economy. I'd rather be responsible for my own retirement, thank you very much. He blasts corporations and the wealthy for companies being concerned about their stock prices & not the welfare of their employees. He thinks only the wealthy can afford to buy stock in a company. Last time I checked, anyone can. He thinks only high paying CEO's benefit from company stock options. I know a lot of lower level employees that became rich off high technology stock options, including secretaries. His stupidity on the topic he wrote on is astounding!!! Hedrick Smith - Hedrick Smith is a journalist who has been a reporter and editor for The New York Times, a producer/correspondent for the PBS show Frontline, and author of several books.